Steve Katz, president of Action Bearing, stands next to the Converse mural on his building at 201 Brighton Avenue, Brighton. To Action Bearing President Steve Katz, a ball bearing that can help take a train from Boston to Washington DC in under three hours is a work of art. But the second generation owner is well aware that the exterior of the location where that bearing came from, Action Bearing headquarters at 201 Brighton Avenue in Brighton, MA, is not. So when Katz was approached by Converse about using the exterior of his building for a mural/ad for the shoe company, he welcomed the idea. “I’ve always said, you can’t shine a sneaker. But I have to commend this particular sneaker company, Converse, for turning a pretty drab space into a work of art,” said Katz. 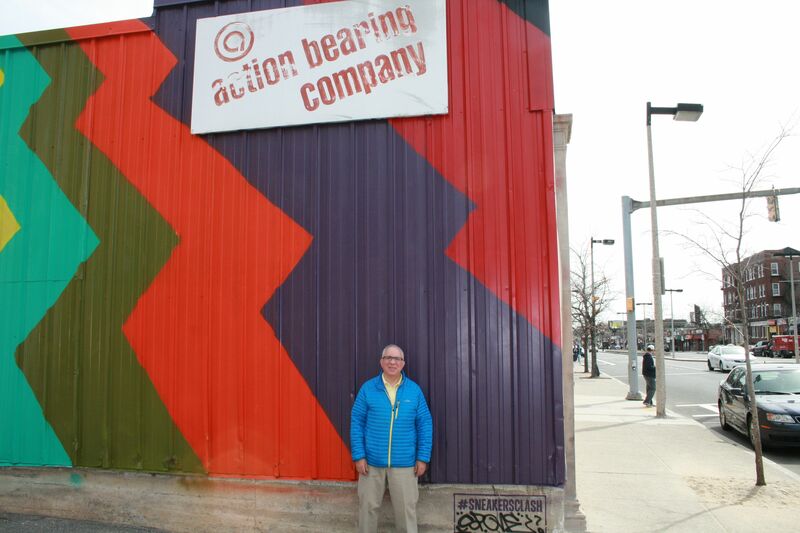 The wall mural/ad covers two sides of Action Bearing’s building at 201 Brighton Avenue. Converse chose Action Bearing’s location based on the high volume of foot traffic on the street and the younger demographic in this urban area. So far, the campaign seems to be a success with Action Bearing staff as it’s been with Brighton Avenue passerbys. “We’ve been in business since 1957 and the exterior of our building probably hasn’t changed a whole lot since then. So our staff has definitely enjoyed the new look, as have our customers,” said Katz. While the company has been compensated for use of the building, Katz would like a little something extra when the one-year agreement expires. “If Converse wishes to renew, it would be kind of nice if they would throw a pair of Chuck Taylors for me and my staff. It’s been a while since I wore a pair of those,” said Katz. In a proud tradition, the same families that started the company in 1957 keep Action Bearing rolling by specializing in bearings for OEM and MRO markets across the country. Action Bearing has a staff of 22 and a 23,000 square foot facility to provide bearings ranging in size from 3mm to tunnel-boring 15-foot-diameter giants. Action Bearing offers customers a one-stop shopping experience. With an online product catalog with more than three million bearings; a vast inventory of bearings; worldwide sourcing; a fixed price program; a knowledgeable staff dedicated to delivering; same day shipping and 24/7 service, Action Bearing has become the leading provider of bearings to OEM and MRO markets in the U.S. Action Bearing maintains headquarters at 201 Brighton Ave. Boston, MA. For more information, contact 617-782-1400 or toll free, 800-225-4587, email info@actionbearing.com or visit www.actionbearing.com.